The labour market effects of import competition from China are becoming increasingly relevant. This column analyses both the direct and indirect labour market effects of rising international trade exposure to China, focusing on Portugal. It suggests that the wages and employment of Portuguese workers are negatively affected by China’s competition in third-country markets. 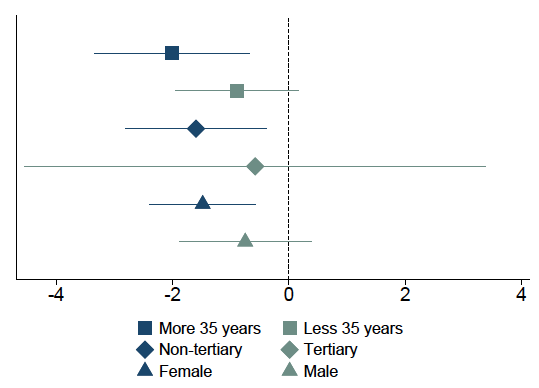 Certain groups such as female, older, and less-educated workers, are particularly badly hit. The impact of international trade on labour markets is a classical question in economics (Stolper and Samuelson, 1941), and one that is currently subject to renewed interest. Over recent decades not only has international trade grown strongly but its pattern has also evolved significantly. Global value chains emerged as a new paradigm for the international organisation of production, while new labour-intensive countries have become key players in the world market. In this context, some recent studies have examined the micro-level effects of rising import penetration on different groups of workers (e.g. Autor et al. , Dauth et al. 2018), generally focusing on countries with specialisation patterns different from those of emerging economies. This research has documented substantial adjustment costs in the domestic industries most exposed to imports from developing countries, especially China, providing empirical evidence on the losers of globalisation. The level of bilateral trade between two countries does not necessarily reflect the degree to which the two countries compete in international markets. The strong growth of Chinese exports can impact the manufacturing sector of a given country not only through intensifying competition in the domestic market, but also in foreign markets where firms from that country compete with China. This indirect, market-stealing effect can become increasingly important for high-income countries, as China’s exports are progressively more diversified and sophisticated, while also less reliant on low-wage labour. For some countries, the additional competitive pressures in international markets posed by developing economies in East Asia, in particular China, have already been in play for several years. In fact, the large export market share gains of China in low-tech, low-skill products, like textiles, clothing, footwear, electric appliances, furniture and toys, were accompanied by losses in the export shares of several other countries, like Portugal and Italy (Figure 1). This pattern is also consistent with the evidence in Dauth et al. (2014) that rising Chinese exports lead to a diversion of German imports from other countries. Notes: EU14 refers to the 15 original Member States of the European Union excluding the reporting country (Portugal or Italy). Export market shares computed as Chinese (Portuguese, Italian) exports to the EU14 divided by total imports of the EU14, by industry. Changes in percentage points from 1993 to 2008. The size of each circle is proportional to the value of Portuguese (Italian) exports of that industry to the EU14 in 1993. For the description of the 83 manufacturing industries considered, please refer to Cabral et al. (2018). Source: Authors’ calculations based on the CEPII - CHELEM database. In a recent paper (Cabral et al. 2018), we examine these two, direct and indirect, effects simultaneously. As a (small) open economy with a comparative advantage profile more comparable to that of China than most other developed economies, Portugal is an interesting country not only to revisit the direct relationships examined in the literature but also to illustrate the largely undocumented indirect effects. Using information on international trade across countries and industries over a long period of time (1993-2008), we propose different measures of these trade shocks. We match them with comprehensive employer-employee panel data from Portugal, linking each worker back in 1993 to the shocks that her initial industry was subject to until the end of the next decade. We then assess how cumulative wage earnings and years of employment over the 1994-2008 period are affected by these measures of trade exposure. Consistent with previous research, we find evidence that China’s expanding role in global trade represented a major negative shock to the Portuguese labour market. However, in contrast to evidence for other countries, the direct effects of Chinese import competition on the Portuguese labour market are mostly non-significant. 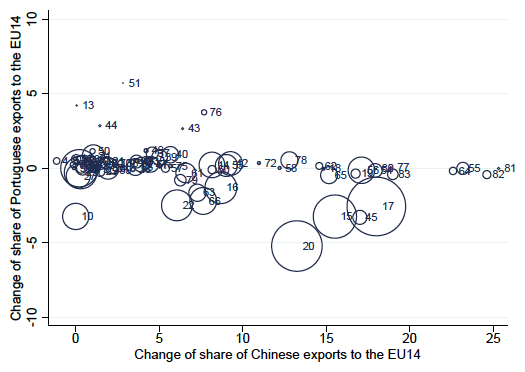 The negative labour market effects associated with China’s emergence stem exclusively from the higher competition of Chinese products in the main destination markets of Portuguese exports. Comparing similar manufacturing workers located in the 25th and 75th percentiles of the distribution of the indirect import exposure, we find that workers in industries more exposed to indirect competition from China saw their total cumulative wages and employment fall by around 25% and 17% from 1994 to 2008, respectively, compared to similar workers in less exposed industries. There is now a wide consensus not only on the net positive effect of international trade on aggregate welfare but also on its heterogeneous distributional consequences and impacts on income inequality within a country (see Autor 2018 for a recent policy-oriented discussion). The adverse impacts of trade tend to be very concentrated among specific groups of workers, industries and locations more vulnerable to trade competition. In this case, the implementation of appropriate public policies aimed at supporting trade-exposed workers and mitigating or even reversing the costs of trade adjustment (including, for instance, hiring incentives, in-work subsidies, and training) can be greatly facilitated by the identification of the groups that tend to be more negatively exposed to globalisation. 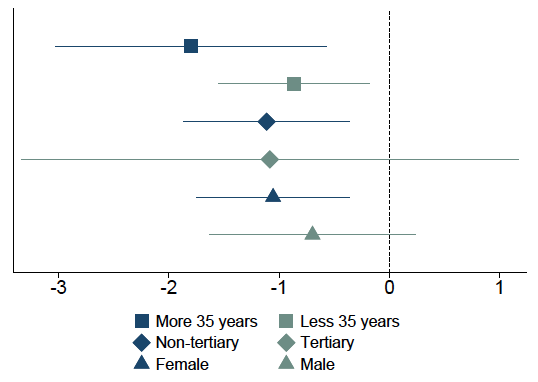 Indeed, in our analysis we find that older, less educated and female workers tend to suffer stronger employment and earning losses (Figure 2). 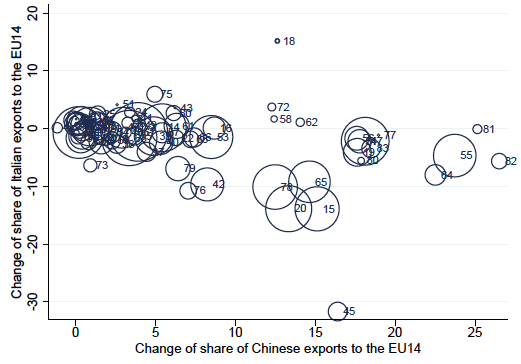 Notes: Estimates of the parameter associated with the measure of indirect import competition from China in the EU14 market, obtained in separate regressions for the different groups of workers. All regressions include a set of individual, firm, and sector-level controls. The 90% confidence intervals are constructed using robust standard errors, clustered at the industry-level. Source: Cabral et al. (2018). Countries may be affected in various ways by the emergence of China as a dominant player in the global market for manufactured goods. However, earlier evidence has focused almost exclusively on what we refer to as direct effects. In contrast, our results, based on detailed micro evidence from Portugal, indicate that the indirect dimension associated with increased competition in third-country markets driven by China’s exports can generate significant negative labour market effects. These findings contribute to a better understanding of the effects of the ‘China shock’, not only in Portugal but also in other countries with significant shares of their workforce employed in relatively labour-intensive exporting firms. Moreover, this indirect effect is also increasingly relevant as more and more industries around the world – including capital- intensive ones – become exposed to the increasing range and quality of China’s exports. The negative labour-market effects of increased trade exposure to China that we document are also found to be heterogeneous across individuals, a result that supports the view that trade integration can increase inequalities. These analyses that allow for greater differentiation of the effects of trade – as well as similar future research for other countries – may be essential for public policies aimed at supporting workers more hurt by globalisation. Authors' note: The opinions expressed represent the views of the authors, they are not necessarily those of the Banco de Portugal or the Eurosystem. Autor, D H (2018), “Trade and labor markets: Lessons from China’s rise”, IZA World of Labor 431: 1–12. Autor, D H, D Dorn, G H Hanson and J Song (2014), “Trade Adjustment: Worker Level Evidence”, The Quarterly Journal of Economics 129(4): 1799–1860. Cabral,S, P SMartins, J P dos Santosand MTavares(2018),“CollateralDamage?Labour Market Effects of Competing with China – at Home and Abroad”, IZA Discussion Paper 11790. Dauth, W, S Findeisen and J Suedekum (2014), “The rise of the East and the Far East: German labor markets and trade integration”, Journal of the European Economic Association 12(6):1643–1675. Dauth, W, S Findeisen and J Suedekum (2018), Adjusting to Globalization in Germany, IZA Discussion Paper 11299. Stolper, W F and P A Samuelson (1941), “Protection and real wages”, The Review of Economic Studies 9(1): 58–73.